My recipe for perfect banana muffins is so good. It is one of my favorite recipes to make with my daughter and of course I like eating them too. I know that the recipe is a good one because I have tasted it AND it quickly has become one of our most popular recipes here on the blog. 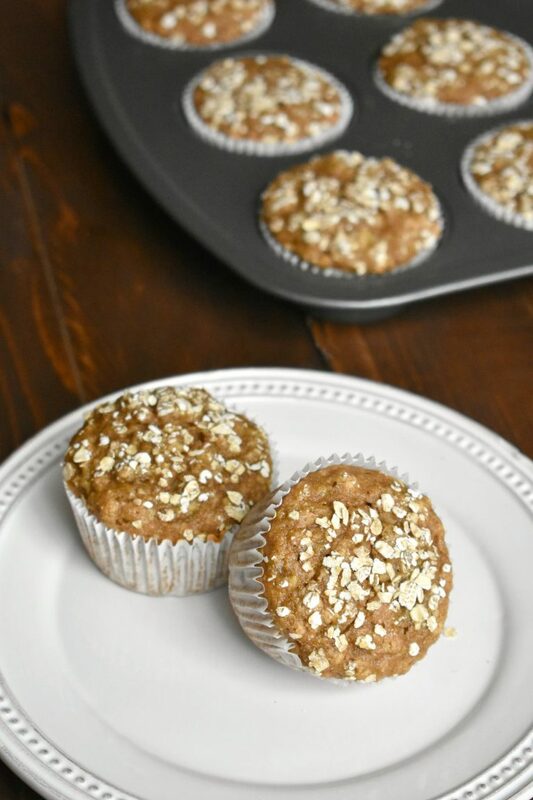 There is something so classic and comforting about a delicious and sweet banana muffin. Sometimes though, it’s nice to mix it up with something a little healthier. 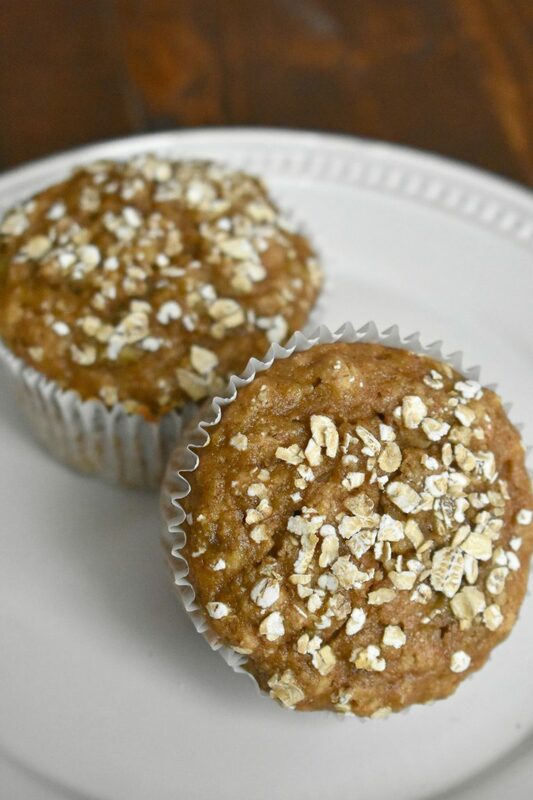 That is where these healthy banana muffins come in. They are made with less sugar, no oil, whole wheat flour and rolled oats. They have more fiber and are more filling and they have much less fat. My kids gobbled these muffins up so quickly they didn’t even notice a difference between the less healthier version. You need to treat the batter a little gently, make sure you don’t over mix or you can make the muffins tough and gummy. So when you add the flour to the batter fold it in with a spatula or a wooden spoon (or even a plastic spoon) until the dry ingredients are just combined. 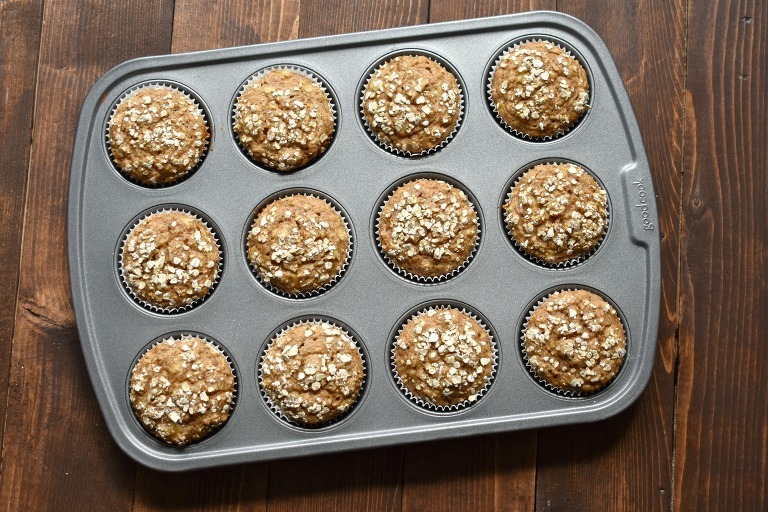 You will need to let these muffins cool completely before unwrapping them. Well, you can unwrap a warm one because they are really yummy straight from the oven, but they stick to the wrappers until they are completely cooled. I suppose you could spray them with a little non-stick spray, but I can’t say I’ve ever done that and I don’t really know what would happen. That’s maybe weird to add into the post. 🙂 Maybe just let them cool down and then they’ll come out of the wrapper! Preheat oven to 325 degrees Fahrenheit, place 12 paper muffin wrappers in a muffin pan. Whisk together the applesauce, honey and syrup. Add the eggs and mix to combine. Add the mashed bananas and milk mix to combine. Whisk in baking soda, baking powder, vanilla, salt and cinnamon. Add the flour and oats and carefully fold in with a wooden spoon or spatula. Treat the batter gently, over mixing will make them tough. Bake for 22-25 minutes, on the center rack, until an inserted toothpick comes out clean.